We had a lot of rain last night, so everything was super humid this morning. We stayed dry though. We lingered a bit late in the tarp this morning as the wind blew cold, raw air around us. 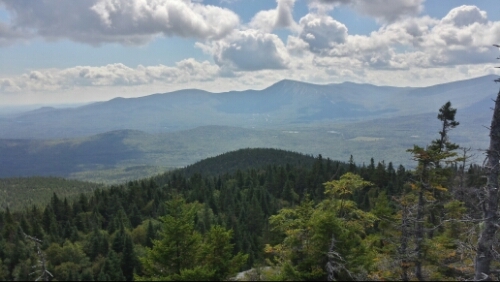 Eventually, we hiked down towards Maine 27, the road that goes to the town of Stratton. 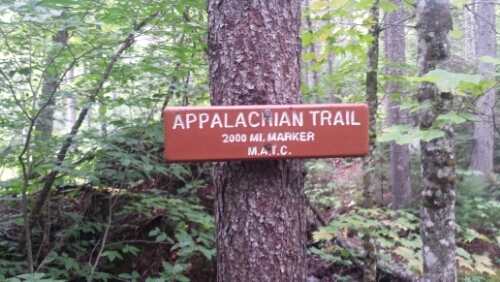 It was slow hiking to get there, as the trail was very rooty and slick. We then started the long and challenging climb up to the Bigelow Range. The climb to get up to the range was pretty slow and rocky. We passed this guy near the way up. It was technically about a mile off from where our guide claimed it should be, but whatever, close enough! 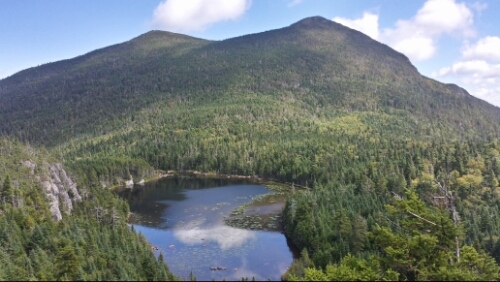 There were some nice views of Horns Pond and the North and South Horn peaks from the ridge. We climbed South Horn, which was a steep rocky half mile. Then we descended and climbed back up to the open ridge of Bigelow West Peak. The views were outstanding. 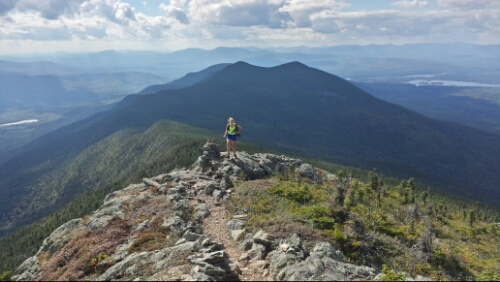 Next up was a brief descent and climb right back up to the Bigelow Avery Peak, which had even more amazing views. The weather was fantastic and the scenery was spectacular. 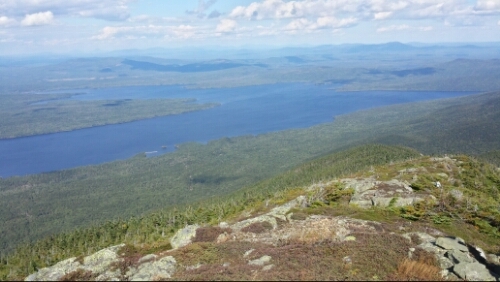 We took a long snack break just sitting and marvelling at these views from Avery Peak. It’s very challenging here in Maine, but the reward for the hard work is awesome. We then climbed down the steep 2 mile descent to the giant boulders down in Safford Notch. We hiked the extra 3/10 of a mile to the campsite here and called it a day around 5pm. Tomorrow we climb off the Bigelow Range. We also have no major mountains tomorrow, which is actually a nice break since these last 3 days have been tough. This entry was posted in updates on September 3, 2014 by Joel. Congrats on being a 2000 miler! What an accomplishment! ….and those vistas continue to amaze! Take care on the 5 remaining mountains! Wow!…to both of you, to your 2000 miles and to the views. To say I’m proud of you is a huge understatement. I marvel at your strength, courage and tenacity. You are both amazing!! 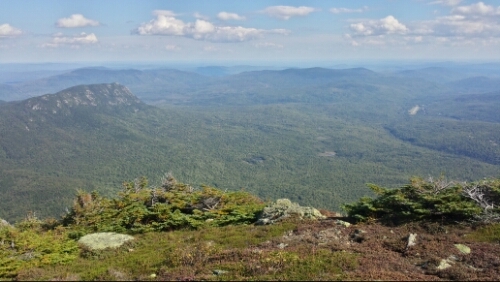 While those Maine mountains sound super-tough, it’s nice to be able to count the remaining mountains on one hand. Go get them!! Show them you’re boss!! Have a nice day off the mountains tomorrow. Good luck in the upcoming rivers and streams and try to stay dry. The Big K is getting closer and calling “Cowboy” and “Trippy” louder and louder. Stay strong! Stay safe and stay healthy. We think of you all the time and send positive vibes. Sending no-rain, no-pain, Maine-ish thoughts, many more prayers and mountains full of love. Congrats on the hiking a couple miles. I don’t know what I’m going to do when you guys finish this thing. I look forward to the update every morning when I get into work. Good luck they rest of the way.